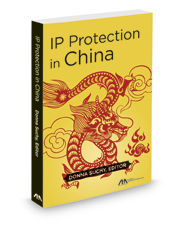 Published by the American Bar Association (ABA), IP Protection in China discusses and summarizes the protection of patents, trade secrets, copyrights and trade secrets in China, including how to work with the appropriate government bodies. Before China's entry into the World Trade Organization (WTO), the Chinese IP regime was out-of-step with international standards. China has made rapid progress since then. To obtain approval for entry, it made all the necessary amendments to its Patent Law, Copyright Law, and Trademark Law, and also revised relevant Implementation Rules to bring such measures into compliance with the Agreement on Trade-Related Aspects of Intellectual Property Rights (TRIPS). Despite full compliance with these standards, the Chinese IP system still involves distinct characteristics: for example, enforcement power is divided between two powerful and independent branches of the government, which can surprise U.S. practitioners accustomed to using the judicial branch as the primary means for addressing IP infringement issues. Written by twenty legal practitioners who are extraordinarily familiar with China's intellectual property laws, this book comes at an important time: China ranks among the top countries for patent filings in the world, which undoubtedly will impact the global economy for decades to come.